I remember as a little kid how so many friends would spend a full day in the car to visit Big Bend National Park on family road trips to the desert. To me, it seemed insane to drive so far, 8-10 hours in a car at that age sounded like absolute torture. I was even grateful we didn't go, but after completing a month-long road trip in South Africa in January (read about that here), the 8 hours from Austin to Big Bend sounded like a piece of cake and we went for it. I’m here to say that it was absolutely worth it. I am a convert that is obsessed with West Texas, road trips and destinations that require many hours in a car to reach (travel goals now include parks like Zion and Yellowstone). Visiting Big Bend National Park is now one of my favorite things to do in Texas. I have completely fallen in love with this under-appreciated tiny park in the desert. This post has everything you need to know if you’re planning on visiting Big Bend National Park. Big Bend is busiest during Spring Break, Thanksgiving weekend and the winter holiday break in December. School holidays combined with comfortable temperatures draw the crowds. The best time of year to visit Big Bend National Park is spring and fall. Temperatures will be mild, not too hot for long hikes and not too cold for camping under the stars. Everything told me visiting Big Bend in the summer was a bad idea because, obviously, it's a desert in the summer. But with the choice of going in summer or not at all, we accepted our fate. In the end, it was hardly insufferable. There is a mountain range in Big Bend, The Chisos, that house the best hikes (read my favorites here) and offer a cool respite from the desert heat. The only limitation we had was being unable to do any of the popular desert hikes. Big Bend is not the easiest national park to get to. This is both a blessing and a curse. The curse is the hurdles you have to jump through but the blessing is not many are willing to make that effort. 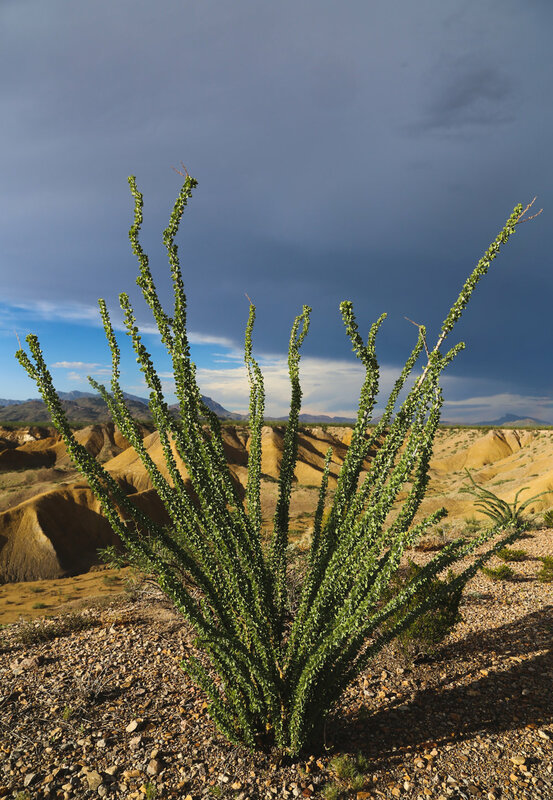 Big Bend is one of the least visiting parks in the National Park Service, offering you a unique opportunity to be truly alone in nature at a time when our parks are inundated with visitors. Willing to make the effort or you’re planning a big Texas road trip? 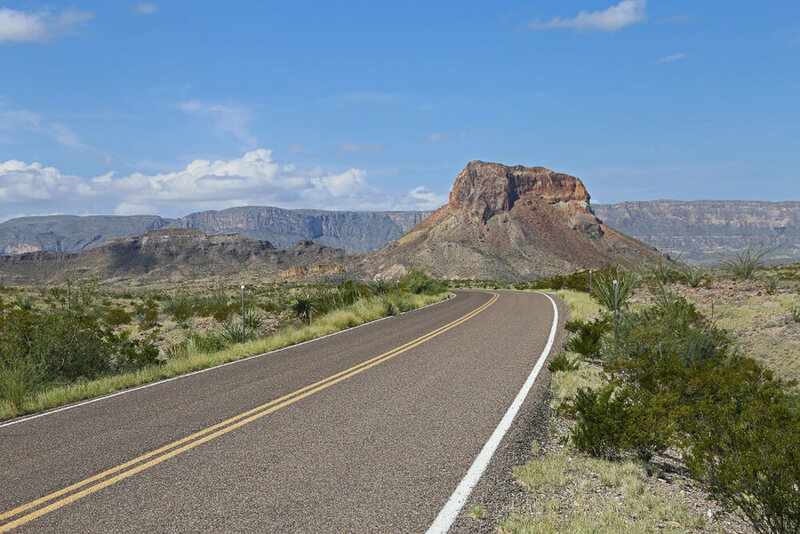 Here is how to get to Big Bend National Park, including our road trip route from Austin to Big Bend and the closest airports. We drove to Big Bend from Austin. There are two routes to choose from: south along the border on Highway 90 or north via I-10. Since we were returning to Austin afterwards we decided to do both routes, driving along the border on the way there and taking I-10 home. The drive along the border was my favorite and we made a lot of stops along the way. From Austin you drive south through San Antonio (if you are road tripping through Texas, spend a couple days here!). We drove straight through until we reached Bracketville, visiting Ft. Clark and a Barton Springs like spring-fed pool. From there we stopped in Del Rio for damn good Mexican food for lunch. We made our last stop in Langtry to see the Judge Roy Bean Museum (a relic from the truly wild, wild west!). We saved I-10 for the drive home because we were ready to go home and the speed limit is 80 mph. Since we made a few stops, I found the difference in total drive time to be minimal. We made a couple cliche road trip pit stops like the giant road runner in Fort Stockton and the Alley Oop comic strip park in Iraan. While those stops can be skipped, I recommend stopped for a tour of the Caverns of Sonora. It will take around 6-7 hours without stops. From Dallas, you can take I-20 straight through to Big Bend in about 8 hours. If it were me, I would add a few days to the trip and make a detour to Marfa (read about our Marfa experience here), stopping in the Davis Mountains for Ft. Davis and the McDonald Observatory on the way. Plan your trip right and you can go to a Star Party. The closest airports are in El Paso or in Midland, close being relative. They are not close. But if you’re flying into Texas and want to shorten your drive you can get a connection from Austin, Houston or Dallas to El Paso or Midland. Rent a car from there and drive 4.5 hours (from El Paso) or 3 hours (from Midland). All of these passes last 7 days. Big Bend National Park is very isolated, so it's best to come prepared. What to bring to Big Bend? Prepare yourself for heat and sun! Water, they recommend 1 gallon per person per day. We had large bottles that we re-filled at every camp or visitor site we passed. If you’ll be camping, bring all your equipment. Consider the fact that you’ll probably be hiking a long distance to get to the campsite so pack light, like these lightweight sleeping bags and this lightweight one person tent. TIP | Always keep an eye on your gas tank. Don't be a gambler with that last quarter tank. The distances are long so I filled up every time I passed a gas station with less than half a tank. Maybe it was overkill but you don't see me stranded in the desert, do you? Also, always keep water and snacks on you, don’t risk getting hungry or dehydrated on the trail or miles from a rest stop. Big Bend consists of three different sections: desert, river, and mountains. I'd recommend having at least three days to be able to do everything justice, but the more the better. More time will allow you to fully explore all three portions of the park. We had four days and left with plenty of things undone, left for next time. Big Bend is one of the smallest national parks in the United States. It's also one of the most isolated, therefore one of the least visited. Their loss, our gain, because we were able to enjoy the park in peace, often going large stretches of time without passing another hiker or car. We were told it's the only national park to enclose an entire mountain range, the Chisos, within its borders. You can stay inside the park itself at either the Chisos Lodge or by camping. For more affordable Big Bend accommodation, look at Airbnb's and motels in the nearby ghost town, Terlingua. CHISOS MOUNTAINS LODGE | The best Big Bend accommodations are within the park at the Chisos Mountains Lodge. This lodge is perfectly located in the Chisos Basin and the trail heads to some of the best hikes are right outside your room. Read reviews on TripAdvisor here. AIRBNB IN TERLINGUA | Terlingua is a 15 minute drive from the park gates and is the best place to base yourself if you plan on staying outside the park. We rented an Airbnb in Terlingua and loved it. The town is quirky and has great restaurants, a gas station and a small supermarket. There are great Airbnbs to rent here ranging from trailers and teepees to private desert homes. For $40 off your first Airbnb stay click here. There are developed campgrounds within the park if you plan on visiting Big Bend with an RV or something similar. They are limited and take reservations from November 15-April 15 and they do reserve quickly during busy season. For more information, check the official NPS website here. There are also campsites along many of the hiking trails in the Chisos and camping along the South Rim is very popular. If you want pitch a tent in the Big Bend back country, read the official site here. 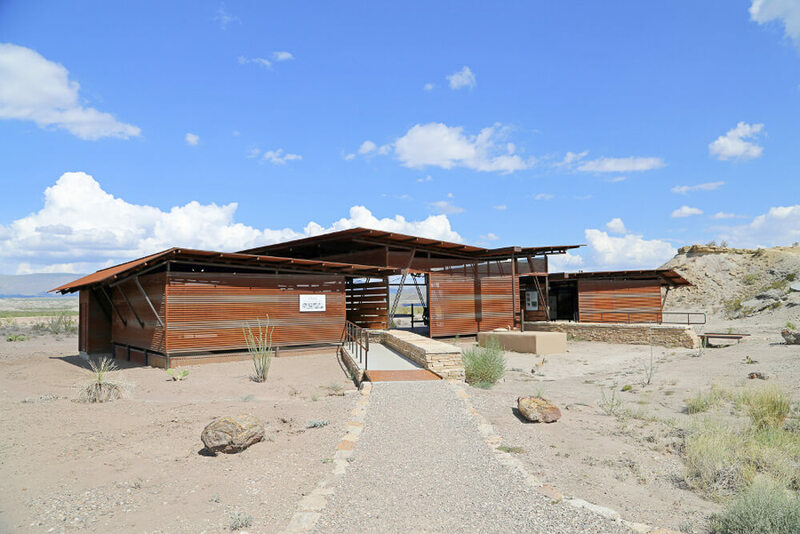 The Panther Junction Visitor Center is a great starting point. You can get a good look at the map and ask the park ranger any questions you have. You have access to WiFi, bathrooms and can re-fill your water bottles here. Not far from Panther Junction is the Fossil Discovery Exhibit. I had no idea that the land Big Bend occupies is home to one of the nation's richest deposits of fossils. The new museum pavilion (above) was really interesting. I admit I originally went for a break from the sun, but it was fascinating. Texas at one point, millions of years ago, looked similar to what the Maldives look like today. This area was an ocean bed, and was home to alligator ancestors the size of a large yellow school bus and horse ancestors the size of a small dog. Volcanic activity, lush forests, fish that make sharks look tame, and enormous dinosaur fossils, Texas has a lot more to it than I knew. We visited in August, in the peak of summer, and the advice we got over and over was to find the Chisos Basin and not look back! It really is a stark contrast from the flat, hot desert to suddenly be gaining altitude surrounded by pine trees and signs warning of bears. Big Bend is the only national park in the US that houses an entire mountain range within its borders. The hikes in the Chisos are some of the most beautiful in the park so be sure to set aside a solid chunk of time to spend there. Watch the sunset from the Window View Trail (above), just steps away from the Chisos Mountain Lodge. This "trail" is a short quarter mile paved path with benches to enjoy the view. Grab a snack or a drink and enjoy the view as the sunsets, it’s breathtaking (cliche alert). There are more than 150 miles of hiking trails in Big Bend. In three days we only covered about 20. There are iconic hikes in each of the three regions including the Lost Mine trail and South Rim in the mountains, Mule Ears in the desert and Santa Elena in the river. For a list of the absolute best hikes, read my post here that highlights the hikes you cannot miss. This 30-mile drive through the desert towards the Santa Elena Canyon is quite the stunner. Stop at the Sotol and Mule Ears viewpoints for picture-worthy views. If you have the energy, hike out to the Mule Ears, or take one of the other shorter desert hikes (you'll see plenty of signs marking the trail heads). Drive to the Castolon Historic District, amidst these turn of the century cavalry buildings you'll find a rest stop and a camper store. Fill your water bottles and continue from here onward to the Santa Elena Canyon, you can take a short hike into the gorgeous canyon. You can cross the border into Mexico and visit Boquillas del Carmen. It's easy, safe and you only need half a day for the visit. Besides our hikes, this was my favorite thing we did in Big Bend. We crossed the border at around 10 am and enjoyed a relaxing lunch of homemade enchiladas overlooking the Rio Grande. If you're interested in going to Boquillas, read my post here for the details. At first glance, a desert may seem barren but keep your eyes open because it's teeming with life. We saw coyotes, three rattlesnakes (from the safety of our car), jackrabbits, kangaroo rats, and more. 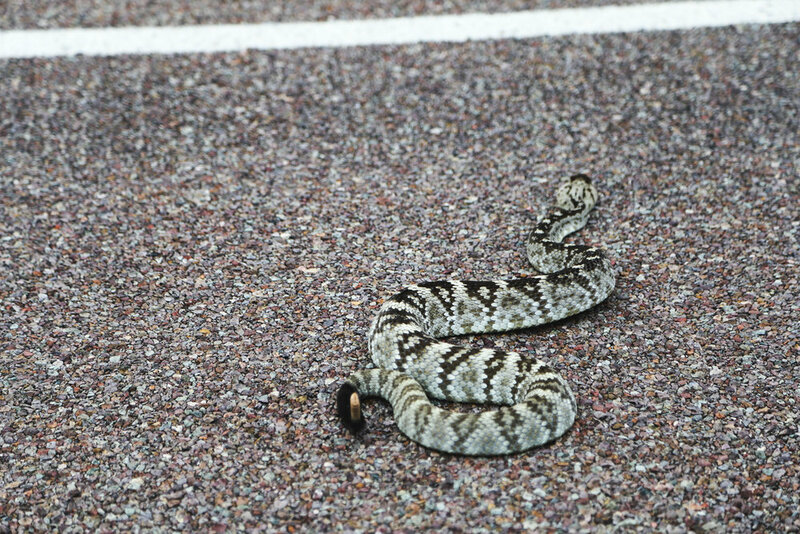 We saw animals mainly in the mornings (coyote) or in the evenings (snakes), rather than in the heat of the day. 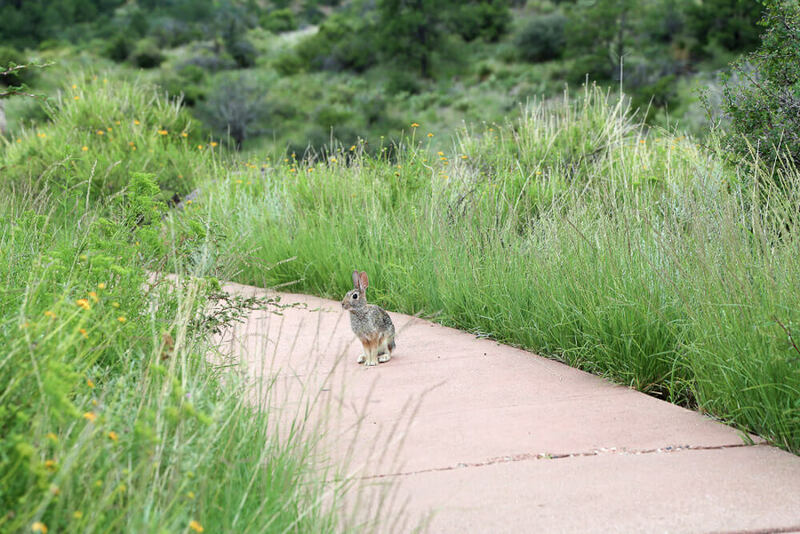 On our hikes in the Chisos, we came across deer and jackrabbits, but we weren't lucky enough to get a rare mountain lion or black bear sighting. There are many options to go on guided canoe trips down the Rio Grande. Choose what works best for your skill level and time limitations. You can choose an easy half day or full day trip, overnight or multi-day trips. We didn't have time for this, so I don't have any particular tour I can personally recommend. However, most seem to offer generally the same thing in regards to half-day and full-day trips, with prices starting at $79. Offerings seem to differ when it comes to multi-day trips, so if you're yearning for more adventure be sure to compare your options. People who love Big Bend, LOVE Big Bend, and it's easy to see why! After one trip to the Chisos and the Rio Grande, I can say I have fallen head over heels for Big Bend. I’m a Texan born and raised. It may have taken me thirty years to get out west, I anticipate many more trips in my future. Embrace the adventure and plan a visit to Big Bend. You won't be disappointed.